Indiana Custard was only produced for 2 years, from 1933-35. The rich ivory color blends well with just about any table setting. 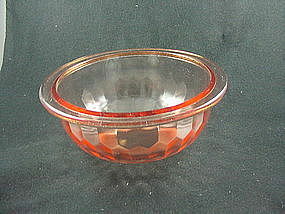 Offered here is the lid for the sugar bowl in excellent condition. Here's your chance to complete your set! See my other listings for more in this wonderful pattern. 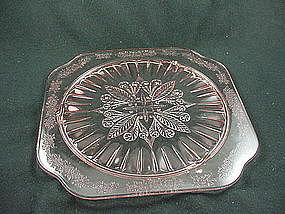 Floral Poinsettia is a depression glass pattern made by Jeannette Glass Company from 1931 to 1935. 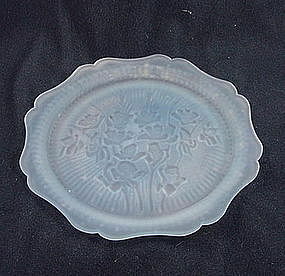 Offered here is the 6 inch bread & butter plate in perfect condition. I have 4 available, price is per plate. See my other listings for more in this pattern. Hex Optic is one of the earlier depression patterns. 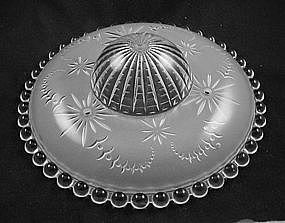 It was made by Jeannette Glass from 1928 to 1932 and used extensively in their kitchenware lines. 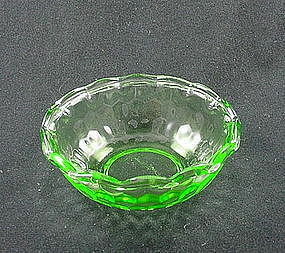 Offered here is the 4 1/2 inch ruffled berry bowl in green in excellent condition. I have 2 available, price is per bowl. See my other listings for more in this pattern. Hex Optic is one of the earlier depression patterns. 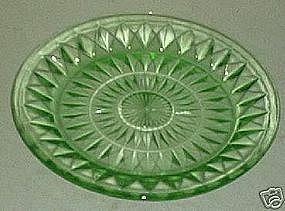 It was made by Jeannette Glass from 1928 to 1932 and used extensively in their kitchenware lines. 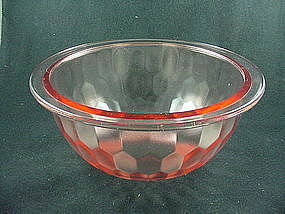 Offered here is the 8 inch flat rimmed mixing bowl in pink in excellent condition. These are very hard to find, so grab it while you can. 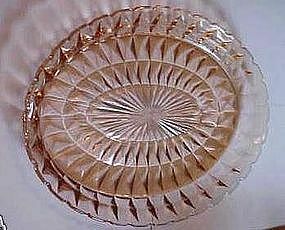 See my other listings for more in this pattern - including the other 2 sizes of flat rimmed mixing bowls to complete the set. Hex Optic is one of the earlier depression patterns. 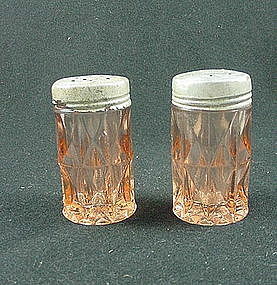 It was made by Jeannette Glass from 1928 to 1932 and used extensively in their kitchenware lines. 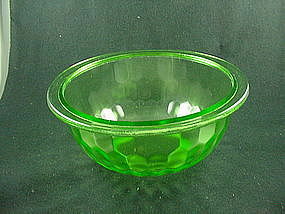 Offered here is the 9 inch flat rimmed mixing bowl in green in excellent condition. These are very hard to find, so grab it while you can. See my other listings for more in this pattern - including the other 2 sizes of flat rimmed mixing bowls to complete the set. Hex Optic is one of the earlier depression patterns. 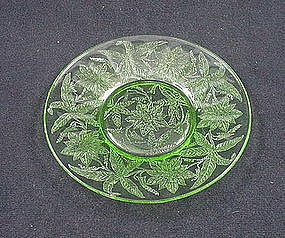 It was made by Jeannette Glass from 1928 to 1932 and used extensively in their kitchenware lines. 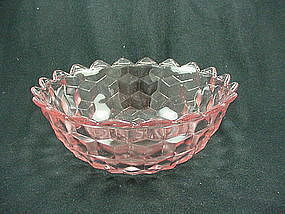 Offered here is the 10 inch flat rimmed mixing bowl in pink in excellent condition. These are very hard to find, so grab it while you can. See my other listings for more in this pattern - including the other 2 sizes of flat rimmed mixing bowls to complete the set. Hex Optic is one of the earlier depression patterns. 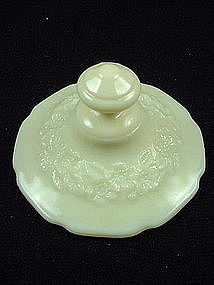 It was made by Jeannette Glass from 1928 to 1932 and used extensively in their kitchenware lines. Offered here is the ice bucket in green in excellent condition. 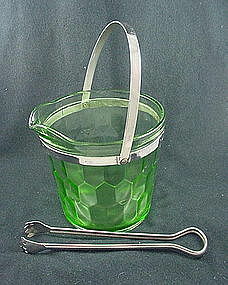 This version has the pour spout so that a reamer can be inserted and the bucket serves double duty. it comes with the original metal handle & serving tongs. See my other listings for more in this pattern.